Gamers of a certain vintage, those of the 16-bit Sega Mega Drive / Genesis and Nintendo SNES era, rarely left their houses. Yes, because the quality of those classic console's games was so high, but equally to avoid the dystopian vision of having to battle the street punk hordes of skid row as soon as they opened their doors. It was a ridiculous vision of the world that the era's console brawlers immortalised, and few pulled it off with as much razzle-dazzle as Streets of Rage. And now, 24 years since the third game in the series was released, Streets of Rage 4 is finally on its way. Which console is Streets of Rage 4 headed to? 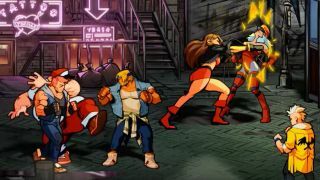 The side-scrolling beat-em up has been given a fresh lick of paint over the pixel originals in keeping with two decades of technological progress, and goes for a suitable cell-shaded comic book look. However, two details remain uncertain: exactly which consoles it will land on, and whether or not it'll feature a new soundtrack by series composers Yuzo Koshiro and Motohiro Kawashima. The tracks have become retro cult classics in their own right, with influential dance sounds. Streets of Rage 4 is, however, being developed in collaboration between Lizardcube (who worked on the recent Wonder Boy remake) and Guard Crush Games, and published by Dotemu, so you can count on it being a faithful recreation. And given Wonder Boy's success on the Nintendo Switch, don't be surprised if it turns up there. Was the Sega Mega Drive, aka Genesis, the best console ever?